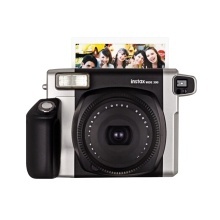 Fujifilm Instax WIDE300, a larger addition instant camera that uses large format 86*108mm instant film, will produce larger images and is suitable for fashion photography,group shots at events, landscape scenes and generally any use that needs a large detailed image. Produce larger images(62 * 99mm) and suitable for fashion photography, group shots at events, landscape scenes, etc. With a 95mm lens that can focus between 2 ranges at 0.9-3 meters and then 3 meters to infinity. Simple operation, just pressing the shutter button and waiting for a few minutes, then you can get a beautiful photo paper.